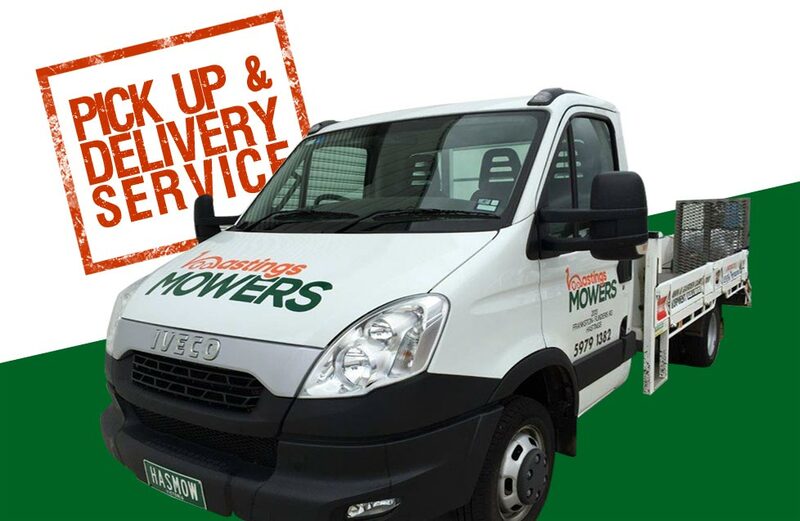 We service and repair all makes and models of ride ons, mowers, chainsaws, brushcutters, blowers, hedgetrimmers, pole saws, demolition saws, tillers, shredders, generators, pumps, engine drills, augers.... if it has a small engine we can handle it. If you have a question or problem, we are happy to provide advice or assistance on any garden equipment. At Hastings Mowers we provide a range of services, from a simple tube replacement or chain sharpen through to a complete overhaul on your ride on mower. We take great pride in having qualified mechanics on site to care for your equipment and to ensure you are satisfied with any service work undertaken. We offer 3 months warranty on all repair work completed, for your peace of mind. We also will provide a quote on any job on request, so that you can be informed of the expected cost prior to completion. No time to drop off your equipment for servicing? Don’t worry we’ve got you covered with our pick up and delivery service. It’s easy, all you have to do is book on (03) 5979 1382 and we will provide you with a quote.